The End of an Era - She Loves Surf! The End of an Era - She Loves Surf! Gavin, my rolly polly little guy. Hanging at the beach with surf moms. OK, maybe the title of this post is a bit dramatic, but the topic is a big one for me and other moms who will soon be sending a child out into the world of real school during the month of August. 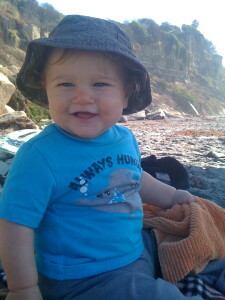 When the surf moms group first started my son Gavin was not even 1. He’s been with me at the beach for as long as he can remember, since he was 3 days old on his first visit to La Jolla Shores. He’s been hanging out with fellow surf moms and their kids since he was a babe. Those first five years of his life have passed by really quickly, with so many memorable and wonderful times, and some sad and stressful ones too. It’s tough to believe that starting at the end of this month I will be dropping Gavin off at elementary school, and in my mother hen state of mind, off to the wolves. Why do so many moms worry about their children going to school? I know that for me it’s partially from fear of the unknown. What if his teacher isn’t nice? What if the other kids make fun of him? What if he beats up other kids? What if he is just fine, and I feel like he doesn’t need me anymore? I also believe that sending a 5 year old off to school brings up memories of one’s own childhood and everything that came with school. I personally had a decent elementary school experience, middle school was a bit rough, and high school was super cruisey. But haven’t things changed dramatically? Aren’t “kids these days” doing everything years earlier and to much greater extremes? These are the fears us moms have, and the only way to buffer the fears is to actually send our little ones off to school and see that they will be just fine. So why the end of an era? 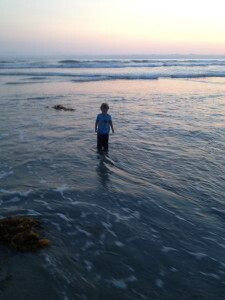 It’s the end of the time when I will be taking Gavin with me to the beach in the middle of the week (except for the occasional day playing hooky). It’s the end of a time when I could choose the number of days and hours he spent at school. It’s the beginning of a period when I will be spending quality time with my younger son, who has 3 more years until he starts kindergarten. It’s the end of the way life has operated for the past 5 years, but the beginning of a new chapter in which my older son starts to use some of the life skills my husband and I have worked so hard to impart to him. It’s the time when Gavin will start to create lasting friendships, leading to slumber parties and toilet papering houses. It’s the revisiting of a time when I will have just one! child with me at the beach for surf play dates. It’s the beginning of exciting times for everyone. OK, now that I’ve written it all down I feel better, and I’ve told myself that I’m ready for these changes. How do you feel about your little ones leaving the coop?! Post comments and/or pics if you want to share! Gavin at 5 1/2, enjoying the water and sunset. He’s ready for all the world has to offer! Sweet post. The schools are so poor performing in my area that we have decided to home school. The decision answers my fears and insecurities as much as it addresses my child’s educational needs. I might feel differently if I had another little tyke at home who needed some one-on-one time, but I just have the one. Good luck. It’ll probably be harder on you than it will be on him. Thanks, Kimberly! I look forward to hearing about your home schooling experience- I’m sure you have your own set of worries or concerns about a new experience. Best of luck!